Hey hey! How is 2018 treating you so far? I can’t believe it’s Thursday already. 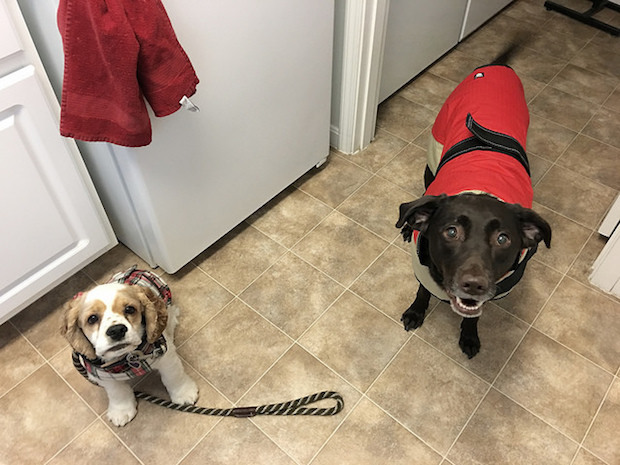 Mavis and I are walking four dogs together today and it’s currently 14 degrees (and dropping…!) and snowing here in Pittsburgh. You better believe I’m going to look like the Michelin Man with all the layers I put on and Mavis will be wearing her winter coat. I have a minute to blog today, so I thought I’d share how we started out the new year! Actually, I’ll start with New Year’s Eve. Jimmy and I went to church in the evening and stayed after for a New Year’s Eve fellowship. Everyone brought along food (I brought chili and corn muffins!) and hung out until around 8:30 pm, when we all discussed the past year, the one ahead, and then had a group prayer. It was a really great way to ring in 2018! Afterwards, Jimmy and I went home and read (I’m still reading and loving this book) on the couch until about 11:00, then went to bed. Since Jimmy and I both had the day off on New Year’s Day, we were able to sleep in a little and have a slow morning. We took Mavis to Starbucks (puppuccino for her, blonde roast for me, and tuxedo mocha for Jimmy!) and Lowe’s. 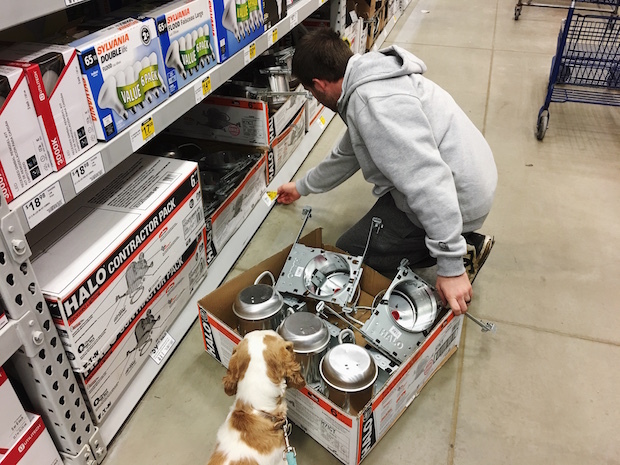 Jimmy wanted to grab some recessed lighting supplies for our basement and I wanted to practice therapy work with Mavis! I walked her around Lowes and lots of people pet her, which was a great opportunity to work on her social skills. I’m continually impressed by how well she does with kids. A toddler grabbed her ears really hard and she simply cried (I thought she would growl, lol) and backed away. Go May May! In the evening, we headed to Mavis’ fourth adult level 1 training class, which was a fun way to kick off the New Year. We spent an hour working on loose leash walking, the “leave it” command, and meeting other people and dogs politely. On Tuesday, it was back to “normal life” post-holidays. It’s feeling good to get into somewhat of a routine again! How did you start 2018? Hello and Happy Sunday! I’m glad everyone enjoyed the picture of Jax (my brother’s new puppy) in my last post. Since Jax was such a hit, I want to share a video of him hanging out with Lola and Brandy. Brandy and Lola love Jax! They all have a grand ol’ time romping around the house! Since I’m in the pet/video mood, here’s a short clip from a snowy trail walk Lola and I went on this week. The high temperature for the day was 13°F, and when I took my hand out of my mitten to film the video it stung from the cold air. That’s probably why the video is so short!! I haven’t been on YouTube in ages! I was looking through my videos, and found this gem from two years ago. Turn your volume down before you play it because Hannah screams at the beginning, haha!